After I was recently notified that forgeries of the Nevis Cricket Players series of stamps have been placed on the market, I searched for more Cricket Player issues that are forged. I was not surprised to find that the Saint Vincent Union Island set has been forged as well. My research into the printer has enabled me to discover modern fake stamps have been created in 2014!! They are being spread across the world through online auction sites like ebay and Delcampe. Everything about them is fake except for one dangerous fact, they have the correct perf size. The gum type is different in it being white in color and very shiny. This gum type was not used until much later years, long after Format went bankrupt thus proving they were not produced by the Format International Security Printers. Obvious differences will be shown below. 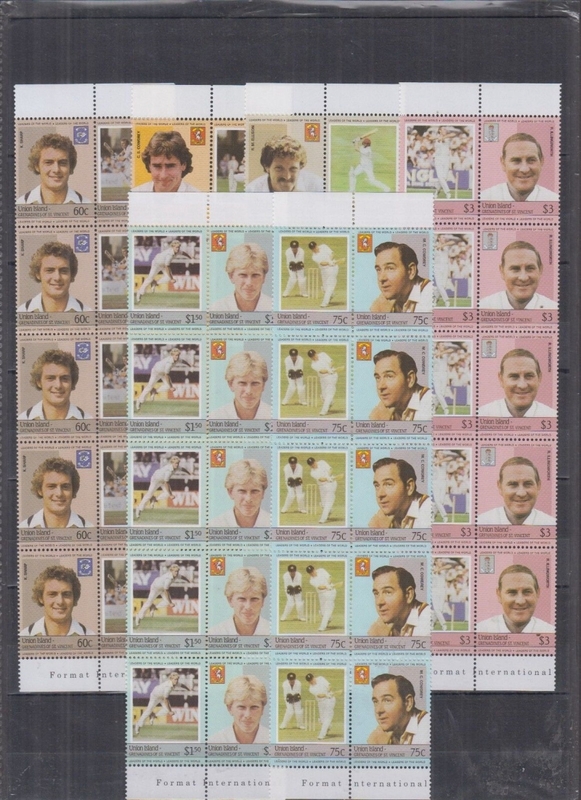 So far I have discovered complete sets of forgeries of the Saint Vincent Union Island Leaders of the World 1984 Cricket Players stamp issues in perforated and imperforate forms. All are being offered online right now as I write this on October 28, 2017. I knew for several months that eBay user balticamber2011 was offering perforated and imperforate forgeries of this issue in strips of five. This user is connected hand and foot with user accounts raimissss, armi777, asrm10 and hobbytrade. The users names according to return addressed envelopes are Raimonds Miskinis and Antanas Miskinis. Business names are Argi-stamps and or SIA stamps and are located in Latvia. Despite repeated alerts that they are selling thousands of forgeries, Despite negative feedbacks, despite a thousand "reports" to eBay these two crooks persist in selling the forgeries on a large scale on eBay. In essence, all of their accounts should be shut down permanently. Even though they sell legitimate stamps as well, because they are persistent in selling forgeries and illegal stamps they should be avoided by everyone! I won the imperforate set of strips from balticamber2011 this month for 99c! This possibly shows that more and more collectors and dealers are catching on to what these crooks are doing. He has not recently offered the perforated set. The last time a perforated set was sold was	September 4. Here is the image from the perforated lot he sold to some unknowing collector. You can see it is short two values. Possibly why he hasn't offered it as much. Who wants an incomplete set? Here is an image of the set of imperforate forgeries I won from balticamber2011 on October 4 of this year. Appropriate negative feedback has been left. 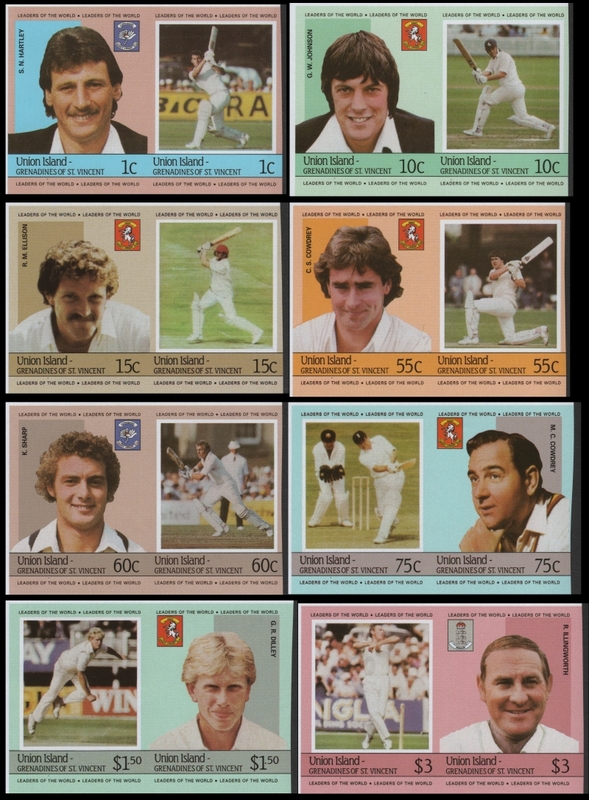 I purchased some time ago the Leaders of the World Cricket Players stamp album which contains examples of every Cricket Players stamp that was produced by the Format International Security Printers. Therefore genuine in all regards. I will use them for comparisons. 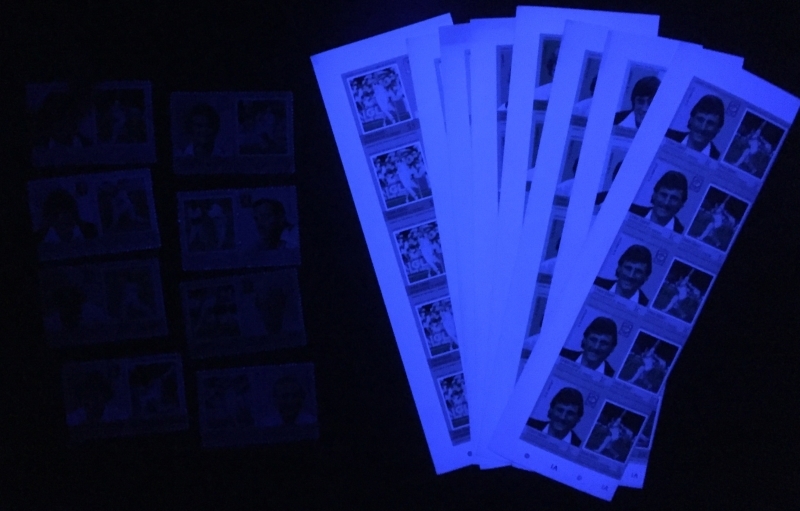 For the imperforate versions of this issue that I have acquired all of the forgeries glow brightly as this image shows. UNTIL NOW THE ONLY IMPERFORATES THAT EXIST FOR THIS ISSUE COME FROM UNIQUE PRESS SHEETS THAT WERE FOUND IN THE ARCHIVE! Imperforates of this issue were either never produced to sell or they were lost or destroyed. Anyone selling imperforates of this issue except me unless they are on Format presentation cards are offering you forgeries! I obtained the unique panes which were cut from the unique press sheet that was with the unique color proof press sheets that were found in the archive. Nobody has offered this issue as imperforate varieties in all these years until now. All of a sudden the above mentioned cons are selling the whole set in strips of five for 99c??? You don't smell a rat??? Unlike the gum on many of the forgeries that are flooding the market right now the gum on the imperforate stamp forgeries is more yellowish in color. It is opague though in comparison with the original gum. This type of gum has appeared on quite a few other issues I have detected as forgeries like the St. Vincent Century of Motoring issue and now many Locomotives sets. It is having a tendancy to curl worse than original gum. I do not know if these were produced earlier by the forger and	held until now, but they did not appear here on the market until recently. Everything else about the forgeries is the same as all the other forgeries I have described as you will see. This yellowish gum does make them harder to detect though at first glance without originals to compare with. I will use the 1c S.N. Hartley stamp pairs for high resolution comparisons. I use 1200dpi scans for viewing. These first comparisons show you how inferior the screens are. 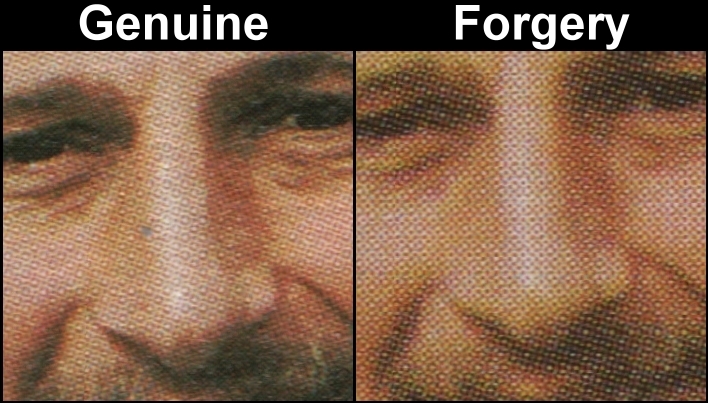 I compare the area around the eyes. You can see that the screens used are much coarser. Much of the details are lost on the forgery. The forgeries still are very dangerous because when imaged for sale by sellers they look almost the same as the originals. Buyers will think it is just the sellers scanner making them look "different". To compensate the forger uses a shinier surface on the face of the stamps. 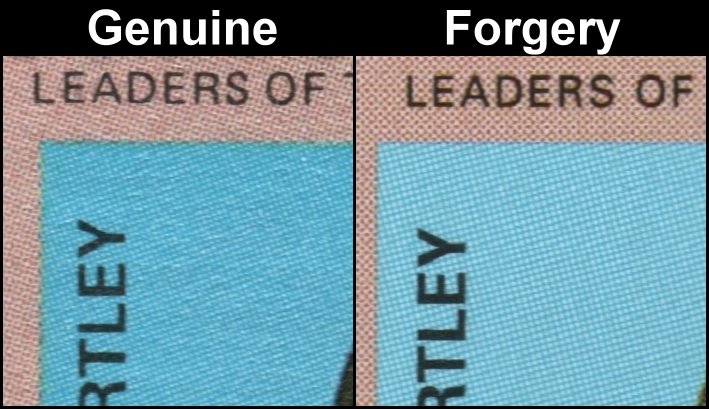 You can see that the "Leaders of the World" fonts are slightly bolder on the forgery. Note the larger screening in the blue background. Now let's look at the Team Country Logo. 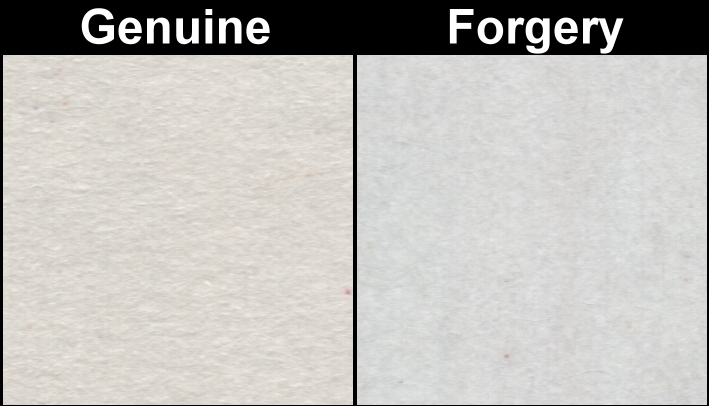 Another easy way to define the forgery. You can see the larger screen patterns on the forgery. On the S.N. Hartley stamp the fonts for the county name "Yorkshire" are smaller and bold on genuine stamps versus much larger and lighter on the fakes. Note the extreme color difference! Blue background on genuine versus purple background on forgeries. Here is one flaw that either the forger knows and uses to define the forgeries for this issue or, just another stupid blunder on the forgers part. On every forged value of this set this flaw is constant. It is on the left stamp above the "leaders of the World" logo on the bottom. Background colors are dangerously close on this stamp pair. The genuine stamps has slightly darker blue than the forgery. Hartley's hair is black on original stamps versus brown on the forgeries. The county logo plaque is dark blue on genuine stamps versus purple on the forgeries. Fonts for "Grenadines of St. Vincent" are much lighter on the genuine stamps. A most telltale sign. The dash next to "UNION ISLAND" on the right is a "~" on genuine stamps. It is a "-" on forgeries. The "S" and "T" in "ST." touch at the top on the forgeries. They are well spaced apart on genuine stamps. The G.W. Johnson stamp forgeries are fairly easy to detect as well. Background colors on genuine stamps are blue-green. On forgeries it is yellow-green. The grass in the field is shades of green on genuine stamps versus yellow-green on forgeries. All font differences as described above are the same. Background colors on genuine stamps are gray-brown and very light gray-brown. On forgeries it is light brown and very light brown. 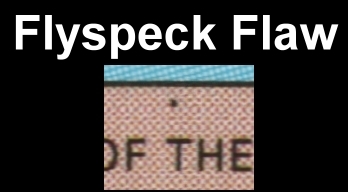 The fonts are the same as described above. Background colors on genuine stamps are orange-tan. On forgeries it is deep yellow-orange. Cowdrey's hair has shades of black in it on genuine stamps versus shades of brown on the forgeries. Extremely different as you can see. Background colors on genuine stamps are black-gray and light brown. On forgeries it is brown-gray and light red-brown. Sharp's hair has shades of black in it on genuine stamps versus shades of brown on the forgeries. Extremely different as you can see. An easy one to define. Background colors on genuine stamps are black-gray and green-blue. On forgeries it is dark brown-gray and light blue. Cowdrey's face has a reddish hue on genuine stamps versus a yellowish hue on the forgeries. Another easy one to detect. Background colors on genuine stamps are green-gray and light yellow-green. On forgeries it is black-gray and light blue-green. Background colors on genuine stamps are red and light red. On forgeries it is brown-red and light dark-pink. 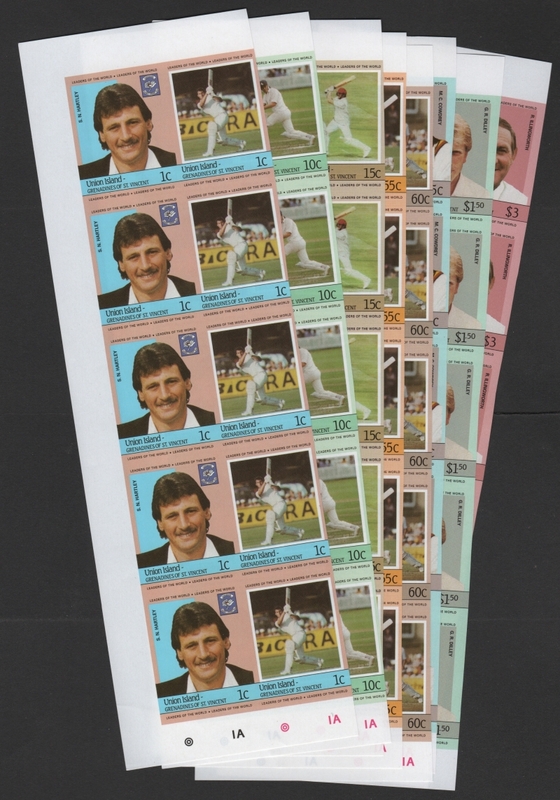 You can now define the Saint Vincent Union Island 1984 Cricket Players stamp forgeries easily and can now possibly avoid being ripped off! Sorry to say this, a lot of you already have been fooled and more of you will be until the right people get serious about it!